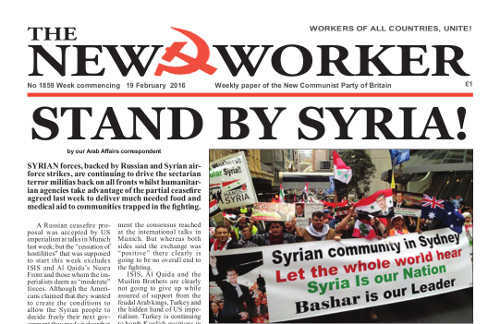 www.newworker.org | 19th February 2016 - Stand by Syria! SYRIAN forces, backed by Russian and Syrian airforce strikes, are continuing to drive the sectarian terror militias back on all fronts whilst humanitarian agencies take advantage of the partial ceasefire agreed last week to deliver much needed food and medical aid to communities trapped in the fighting. A Russian ceasefire proposal was accepted by US imperialism at talks in Munich last week; but the “cessation of hostilities” that was supposed to start this week excludes ISIS and Al Qaida’s Nusra Front and those whom the imperialists deem as “moderate” forces. Although the Americans claimed that they wanted to create the conditions to allow the Syrian people to decide freely their next government they made it clear that they still want regime-change and that they will continue to back the so-called “moderate” forces fighting to oust Bashar al Assad’s popular front government in Damascus. A REPORT released last week into the future needs of Britain’s mental health services revealed that three quarters of mental health patients are not getting any help at all. At the same time there is a steep rise in the number of people killing themselves. The report, A Five Year Forward View for Mental Health, was commissioned by the Government and put together by Paul Farmer, chief executive of the mental health charity Mind. The Government delayed its publication by months, releasing it just as David Cameron was about to announce a transformation in mental health services. Whilst the prime minister is boasting of his focus on mental health six years after he pledged to put mental wellbeing at the centre of his government, his own taskforce has condemned years of underinvestment and laid a significant portion of the blame on the current administration. HEALTH Secretary Jeremy Hunt last week decided to impose the unpopular and unfair new contract on junior doctors that will cut their overall pay by about £30 a week and force them to work at weekends without unsocial hours payments. Many young doctors are threatening to quit and/or emigrate. Some already have. But there is a long-standing agenda behind this, and doctors quitting is all part of the plan to kill the NHS and create a health service in Britain based on private insurance — as in the United States. This plan goes back to the Thatcher years and indignation amongst the top Tories that the existence of the NHS was preventing private health insurers from making the same sort of fortunes that they could in the US. Thatcher did not dare to make a full frontal assault on the NHS — it is far too popular. So in the back rooms and think tanks of the Tory party a long-term strategy was hatched.